The Ballantyne, located in Charlotte, North Carolina, welcomes guests with exceptional service, complemented by a timeless elegance. Enjoy resort-style amenities including spa, golf, fitness, exquisite dining and leisure offerings. The Ballantyne features beautiful hotel rooms, a cottage and lodge retreat with sophisticated meeting, wedding and event venues in a vibrant setting. 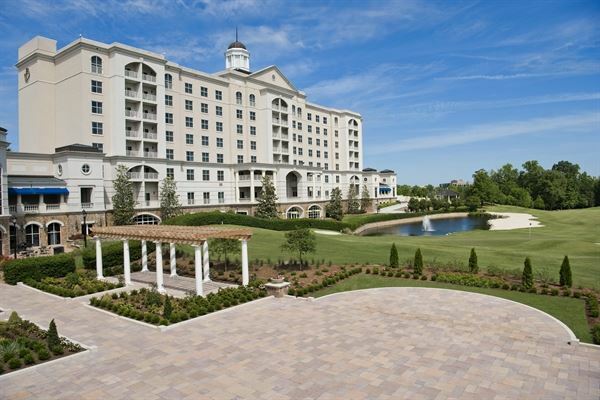 The Ballantyne is located within 18 miles of Uptown Charlotte and Charlotte Douglas International Airport. In addition to its great accessibility to Charlotte, the hotel is set amidst shopping, dining, retail and a thriving business community. Many people in the Charlotte area know the Ballantyne Hotel as an upscale hotel and restaurant and they're right. The Ballantyne Hotel offers a classy environment for all types of meeting needs including personal and business. As someone who has attended both business functions and personal meals at the Ballantyne Hotel I feel confident saying that it is a classy and effective place to meet with colleagues or friends. In my professional exposure to The Ballantyne Hotel, my colleagues and I were provided with a large conference room equip with a projector, ample seating, video recording devices and audio technology. In addition to the technological amenities that were provided we were also provided fun and delicious snacks while waiting for the meeting to commence. It was a great way to get out of the office, spend time with colleagues and learn about our company. On a personal level, the food and bar at the Ballantyne are adequate but in my opinion are lacking in the service department. As stated, Ballantyne Hotel is an upscale hotel but I feel that the staff may be under the impression that since they are such an upscale venue that customer service is not so important. When being waited on by the bartender in a smaller group I found that the bartender was not only inattentive to our table but also was rude at times when we needed anything. The drinks were delicious and all that they needed to be and the food was great but my only complaint for The Ballantyne Hotel was the lacking customer service skills of the wait staff.